C-TRAWLER 29 is based on the same seaworthy hull designed for a Nova Scotian boat builder who wanted an able motorsailor to use in open waters of the Canadian Maritimes. She has accommodations for four or five in separate areas of the boat. There is standing head room in the forward cabin and pilothouse. Construction is plywood and epoxy or aluminum, and there is a new steel hull version available. Estimated cost for quality construction materials (not including power or sails) is $44,000. This cost includes a high level of outfit and finish you can be proud of after putting the effort into building this fine boat. Purchase and Download Study Plans for the C-TRAWLER 29 for $5.00 in PDF format (zipped file). 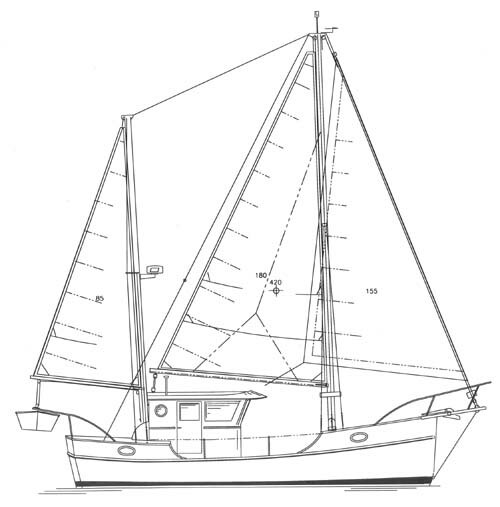 Purchase Construction Plans for the C-TRAWLER 29 for $460.00 for delivery by US Postal Service.